1. Go to the lake. Really, this is the Inland Northwest default for Memorial Day weekend. Chances are fair to decent that we’ll get at least one good weather day this weekend. Grab your beach chair, pack a cooler and slap on some sunscreen. The water’s still too cold, but a day at the lake can’t be beat. 2. JJ Grey & Mofro. Many area music halls go more or less dark over Memorial Day weekend as bands and their fans get sucked into Sasquatch for the duration. Not so in Sandpoint. Tonight at the Panida Theater, JJ Grey & Mofro will bring their brand of soul, funk, R&B, blues and Southern Rock to the Idaho Panhandle. The band with its roots in north Florida is touring behind the new record “The River.” The show is sponsored by radio station KPED; call (208) 263-2179 or visit pandia.org for ticket information. For less than a couple pints of good beer, you can drop in for a salsa dance lesson, then stick around for a night of dancing. It happens on Saturday nights at Simply Dance Studio, 820 W. Sprague Ave., right across from the Davenport Hotel. Lessons run from 8:15 to 9:15 p.m., followed by open dancing until 1 a.m. And the cost of all this? Just $7 a person. Call (509) 892-1480 or visit www.simplydancestudio.com for more information. The cult comedy, which was canceled in 2006 after three seasons of crazed mirth, is finally back. Netflix has financed a fourth season of the show, bringing back the entire Bluth family for 15 more episodes, which go live on Netflix streaming at 12:01 a.m. Sunday. So invite some friends over and whip up a batch of frozen bananas – you might want to skip the hot ham water. Jus’ sayin’ – and see if Michael Bluth (Jason Bateman) was able to keep his profoundly dysfunctional family together. If you were a kid in Spokane in the 1960s and ’70s, chances are excellent that you watched “Romper Room.” “Miss Florence” Petheram, who hosted the Spokane edition of “Romper Room” for 19 years – first at KREM, then on KHQ – will return to Spokane to read from her new children’s book, “Magic is for When You Need It,” at 2 p.m. Saturday at Auntie’s Bookstore, 402 W. Main Ave. We just can’t promise she’ll read your name through her Magic Mirror. 8. Hit the park. Any park. 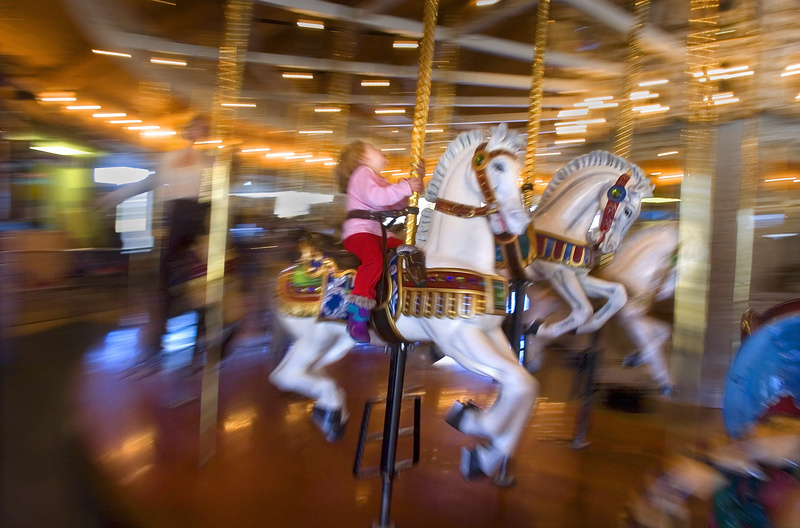 Riverfront Park, with the Carrousel and the Pavilion attractions, are a good bet. Or, if the weather suits you, area splash pads are set to open for the season in the city of Spokane today and in Coeur d’Alene on Saturday. Splash pads in Spokane Valley opened more than a week ago. 9. Head to a museum. The Northwest Museum of Arts and Culture has four exhibits on now: “David Douglas: A Naturalist at Work,” “Two to Tango: Artist and Viewer,” “Lasting Heritage” and “SPOMa: Spokane Modern Architecture.” The Museum of North Idaho in Coeur d’Alene is open for the season and is showcasing the area’s history. Both museums, as well as the Post Falls Historical Society’s museum and the Cheney Historical Museum, are part of the Blue Star Museum initiative. Beginning Memorial Day and running through Labor Day, active duty military personnel and their families will be admitted to participating museums for free. Two new rides open at Silverwood on Saturday. Spin Cycle is touted as being the first ride of its kind in the world. Riders are harnessed into a round disc that spins 360 degrees. The whole thing then swings like a pendulum, taking riders upside down. On the other end of the spectrum is Barnstormer, a family-friendly ride designed to make you feel as if you’re flying among the clouds. Located in Garfield’s Summer Camp, it is mild enough for all ages.